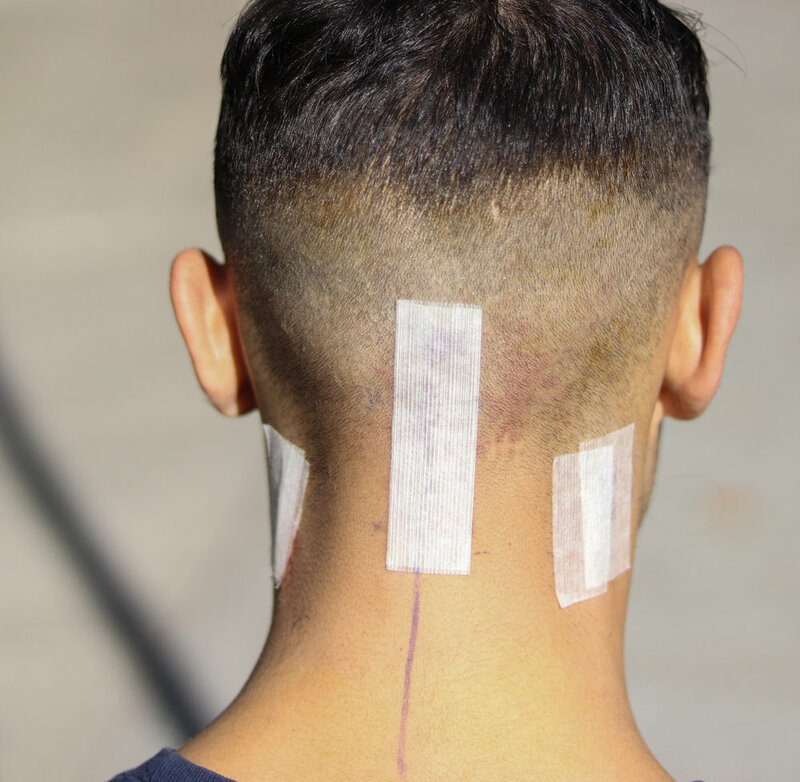 How have I managed my 3 migraine surgery incisions? How are they healing? On December 2, 2017 I had migraine surgery with Dr. Ziv Peled. 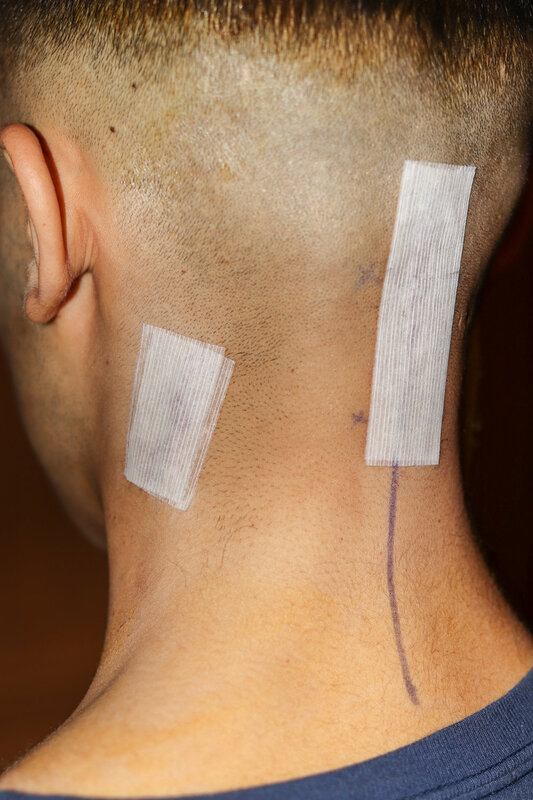 He decompressed my left and right greater occipital nerves, and cut out my left and right lesser and third occipital nerves because they were damaged beyond repair. 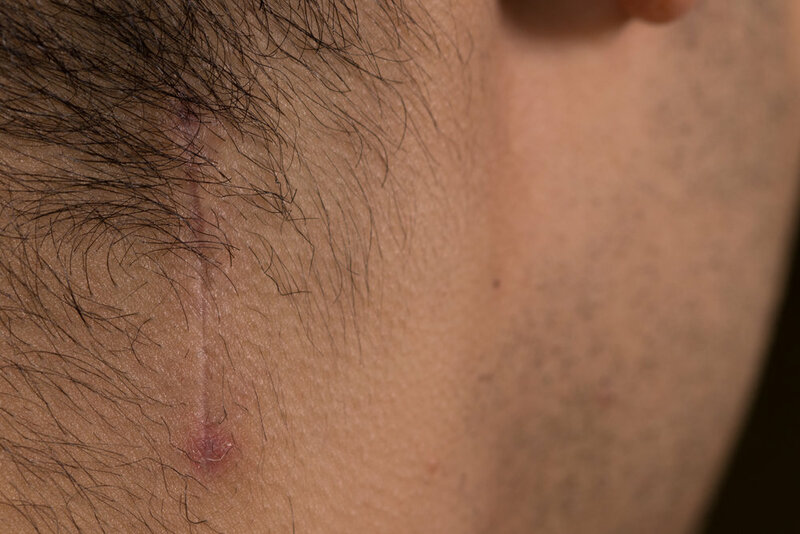 He made three incisions during the procedure. Today is January 3, 2018. Here's how I took care of my wounds during the first month, and what they look like today. Since the day of the surgery, my 3 surgical incisions have been pain-free and have healed rapidly and without issue. I did not use antibiotics, pain medicine or any other medication at any point. Instead, I was very careful to be as healthy as possible while healing, something which I have become skilled at as a result of learning to manage my migraines all these years. 4 days. Dr. Peled replaces bandages. The day after the procedure I went for a few short walks in the city, including up a steep incline to the top of Buena Vista Park in San Francisco. I wanted as much fresh air, sunlight and movement as I could handle. I have walked and exercised every day since the procedure. 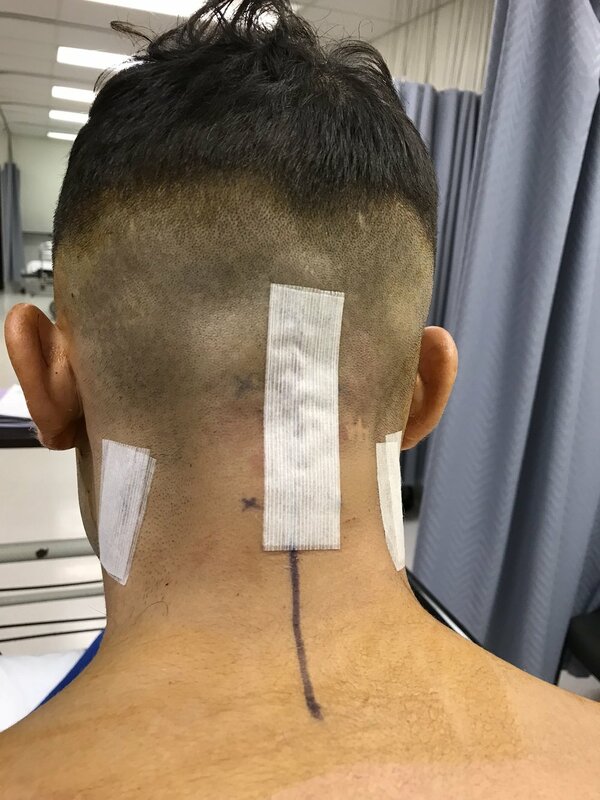 In the weeks leading up to the migraine surgery I began training myself to sleep on my side, as I knew that my incisions would make any back sleeping difficult. Actually, within a few days after surgery I was able to lie on my back, onto the wounds. It was and continues to be awkward and a bit uncomfortable due to the back third of my scalp being numb. But it is definitely doable, and although I continue to sleep mostly on my side, it's nice to stretch out on my back every now and then. The first set of bandages remained on the wounds from the day of the surgery until my follow-up 4 days later. At the follow-up, Dr. Peled replaced them and the new bandages lasted 12 days until they starting peeling off and I removed them for good. 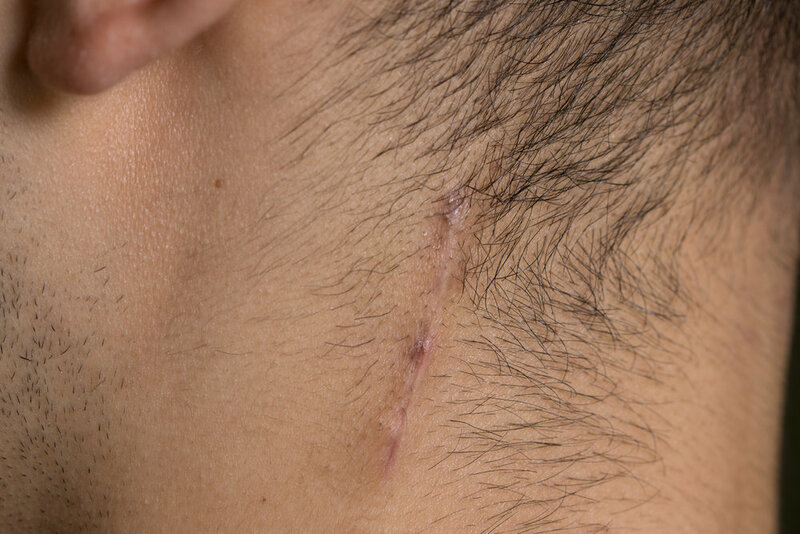 One of the trickiest parts of the whole healing process was removing the bandage glue from around the incisions after peeling off the bandage itself. What finally worked was painting olive oil over the glue with a cue-tip, allowing it to soak for a few minutes, and then wiping it off with a piece of sterile gauze. As soon as the bandages were off (exactly 16 days after surgery) I began massaging the area around the incisions twice a day by the bathroom sink with warm salted water, which mostly just serves as a lubricant for my fingertips. In the first few days, the massage helped to clean any remaining bandage glue from around the incisions. To this day I continue to massage the incisions (and my entire scalp) last thing before bed and first thing in the morning before showering. While massaging I use my finger tips to dig gently into the muscles and other structure that were effected by surgery. These are the same areas I massaged so regularly in order to relieve my headaches, so I am no stranger to the territory. 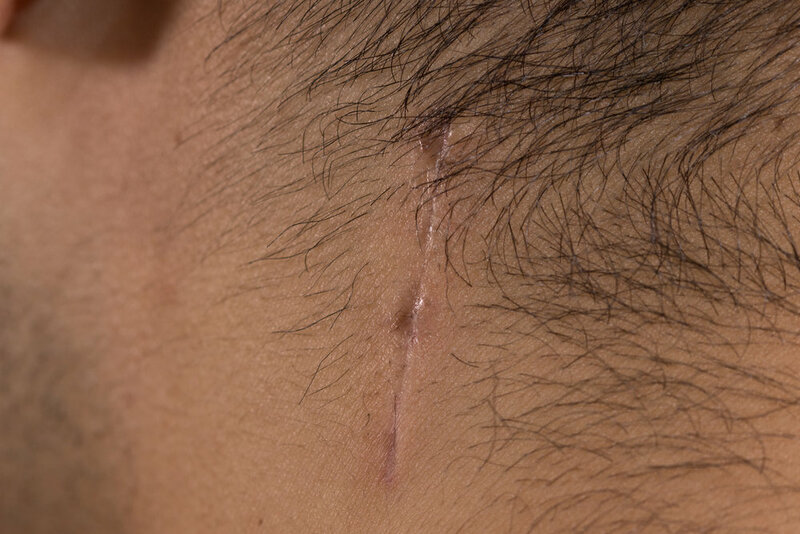 On day 20 or so, I began massaging directly on top of the incision, sliding my finger gently in the down direction repeatedly along all three wounds. With the massage I mix in some light physical therapy, mostly neck stretches and exercises. I rotate my head left and right, up and down, and try to touch my ears to my shoulders. Just the basics. 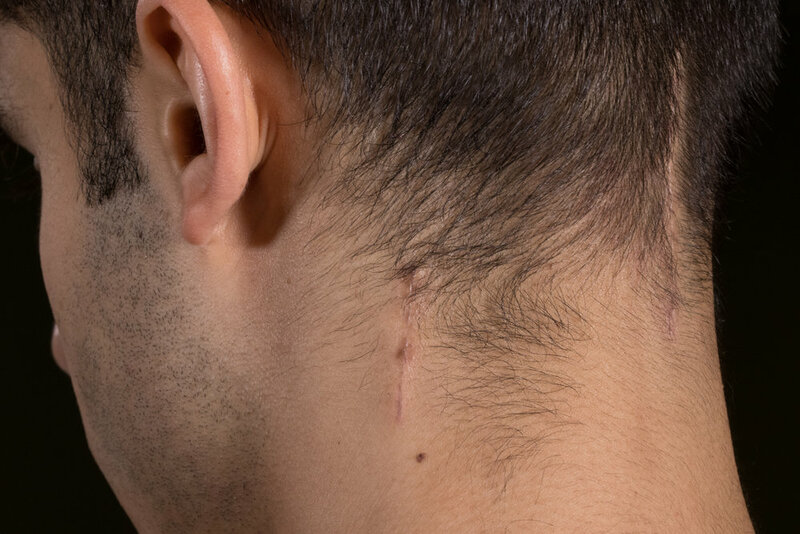 Dr. Peled told me that it was important that I not become stiff-necked and that I create opportunity for the decompressed nerves to slide in their new beds so that new scar tissue does not form around them during healing. He also told me to stop any motion or stretch that was too painful, advice which I continue to heed. These combo massage/exercise sessions feel amazing and are a great way to start and end the day. I am certain they have been a boon to my migraine surgery healing. Learn more about the status of my headaches or how I managed my post-operative limitations during the first month of migraine surgery recovery. Migraine Surgery Recovery Month 1: Any Headaches?